AgroAtlas - Crops - Cucumis melo L. - Melon, Muskmelon. Cucumis melo L. - Melon, Muskmelon. Family Cucurbitaceae, genus Cucumis L.
2n=24. Annual plant. The main stem thin, orbicular-faceted, creeping, up to 3 m lenght, covered with rigid hairs. Leaves orbicular or kidney-shaped, integral or lobate, hispid, with long leafstalks. Leaves blade up to 14 cm length and more than 20 cm width. Auxiliary tendrils are not branchy. Flowers diclinous, sometimes bisexual, , with yellow corolla. Pistillate flowers are formed basically on lateral shoots in auxils of leaves. Staminate flowers are collected in 5-15 floral corymbs. Ratio staminate and pistillate flowers on a plant 15-20:1. Ovary at pistillate flowers lower or semi-lower 3-4-5 separate. In pistillate flowers four stamens have grown together in pairs and 1 stamen is free. Pollinated by insects. There are formed 5-7 fruits on a plant. Fruit - polyspermous melon with various form (from spherical up to serpentine-formed) and colouring (white, yellow, green, brown with strips). The grid on a surface of fruits are rich with fine cracks, at some sorts grid is absent or is poorly advanced. Pulp white, yellow, orange. Weight of fruits from 2 up to 9 ( 0,2-16 ) kg depends on sort. Fruits of a melon have an internal cavity in which placentae with seeds are placed. Seeds white with a cream shade, 9-15 mm length. Weight of 1000 seeds 30-75 g. Germinating capacity seeds of 6-8 years. The basic centre of an origin of a melon are areas of Forward, Average and tropical Asia. The culture is known more than 2 thousand years. It was delivered in Lower Volga from Middle Asia in 15-16 century. It is occupied about 200 thousand hectares on the territory of former USSR. The basic areas of cultivation - Central Asia and Kazakhstan, the Lower Volga region, Ukraine, Moldova, Caucasus and Transcaucasia. Photophilous and thermophilic plant. Optimum temperature for growth of 25-35-40° C. Transfers overheating of leaves to 60° C. Does not keep frosts. A drought-resistant plant. Development of a melon needs a plenty of soil moisture, and dryness of air.Necessary sum of active temperature 2000-3000° C. Demanding to soil fertility. 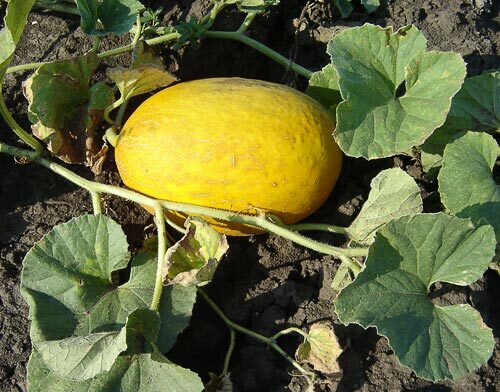 In a droughty zone of the Lower Volga region a melon is cultivated on dark-coloured sandy loams and easy loams, on Northern Caucasus and in a steppe zone of Ukraine - on easy both average loams and sandy chernozems, in Central Asia - on sandy fertilized soil. Flowering begins in 25-30 days after occurrence of shoots, fruits grow ripe in 30-60 days after flowering. It is known more than 500 grades. European grades: Ranniaja 133, Desertnaja 5, Kubanka 93, Komsomolka 142, Kolhoznitsa 593; Asian grades: Bukharka 944, Kapchagajskaja, Kojbash 476. Food culture. Fruits contain: saccharose 16-18 till 30 %; cellulose and hemicellulose 2.5-6.7 %, pectins 1-3.5 %, carotin up to 16 mg, vitamin C, mineral salts. Use in a fresh kind, dry on the sun, make candied fruits, jam, juice, melon honey (bekmez contains 60 % of sugars). Average productivity in irrigated conditions (Central Asia) 30-40 ton per hectare, in not irrigated conditions - up to 20 ton per hektare. Belik V.F. Melon growing cultures. Moscow 1975. The directory on vegetable growing and melon growing. Donetsk, 1971. The world of cultural plants. The directory/V.D. Baranov, G.V.Ustimenko. Moscow, 1994, 381 p.